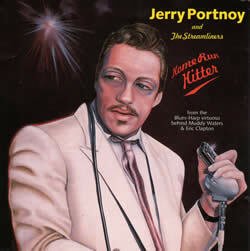 In 1995, Jerry Portnoy recorded his landmark harmonica album Home Run Hitter with The Streamliners. The record’s producer was Kim Wilson of The Fabulous Thunderbirds, while Duke Robillard contributed guitar and vocals to the project. The result is a collection of songs that bounce, groove and swing like a beast. For harmonica players, the album provides many rewarding lines of exploration. This is partly owing to the rhythms and styles Portnoy uses, but primarily because of his attention to detail. The title track Home Run Hitter for example, is one of the most perfect examples of first position blues harping you’ll ever hear. In Misty (the 1954 jazz standard written by pianist Erroll Garner, adopted by Johnny Mathis with lyrics by Johnny Burke), Portnoy demonstrates his ability to hit and hold awkward bends that would leave most of us severely exposed. For many years a tab of Portnoy’s rendition has been available on line. You can view it here. On many occasions I have tried to play from it, but found myself stumped. The reasons for this have now become apparent. Firstly, I suspect a lot of care was taken in choosing the optimum harp register for the track. Unless you have an Ab harp, you won’t sound as moody as Portnoy and the melody won’t be as comfortable to play. The textures are lost. (Oddly an A or Bb facilitates neither the depth of bend and tone at the bottom, nor the same hit and control at the top). Secondly, the tab carries some inaccuracies and is incomplete. So here is the tab according to the Good Doctor for Jerry Portnoy’s version of Misty. Full acknowledgment and credit to all those that have gone before and are yet to follow. Enjoy it, rip it up and tell all your friends! 3D” 2D 2B 1B 1D……glissando to, and then sustain 4D…. Sorry, I dont understand what harmonica need to play this tab. Diatonic A maybe? Hi Maximo. Jerry uses an Ab, but you could use A no problem.